TP-Link has launched a new Wi-Fi Range extender called the RE305. 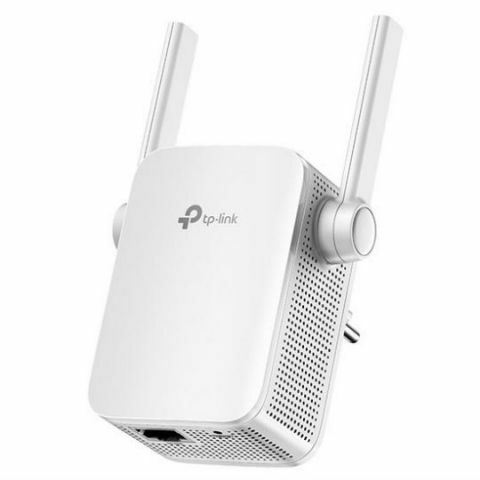 The TP-Link RE305 Range Extender uses 2.4GHz 300Mbps and 5GHz 867Mbps dual bands. It can also be set up using and Android or iOS device via the the Tether app. The company also claims that it can work with any Wi-Fi Router or wireless access point. Tired of Wi-Fi Dead Zones in your home? TP-Link®, a leading global provider of consumer and business networking products introduces RE305 Range Extender which connects to your Wi-Fi router wirelessly, strengthening and expanding its signal into areas it can’t reach on its own, while reducing signal interference to ensure reliable Wi-Fi coverage throughout your home or office. How many times it has been that you were relaxing on your house balcony or enjoying a smooth coffee on recliner near your private pool. But wait!! The tablet in your hand or smartphone with you is not having Wi-Fi connection from the router which is connected on other end of your house. Well it’s not the mistake of your router, but an obstacle that many router face. RE305 is perfect solution for this drawbacks, it is a perfect companion your router always needed. RE305 is like an extending hand to that weak signal which is crawling to reach your device across rooms. This AC1200 Mbps Range Extender just picks up those crawling signal and put them on super-fast rocket to reach to you. Voila, and you get the Signal your device deserves. The RE305 lets you keep more devices connected at the same time with its 2.4GHz 300Mbps and 5GHz 867Mbps dual bands. Use the 2.4GHz band to send email and browse the web, and the 5GHz band for gaming and HD streaming, this range Extender supports your dual band router without compressing on one of its best feature- Dual Band Functionality. An Intelligent Signal light helps you quickly find the best location to install the range extender.